I woke up this morning, for various reasons, even more tired than usual. Which meant that when I noticed Yaakov’s Fireman Sam t-shirt had a tomato seed dried onto its left shoulder, instead of walking up 18 steps to get a new shirt, I just scratched off the seed. A little red blotch on a shirt never hurt anyone. I took another look at the t-shirt, red blotch and all. And realized I did vaguely remember that this shirt had, in fact, been purchased to wear to bed. But I was really tired, and 18 stairs is, well, 18 stairs. I looked at his t-shirt and realized that there were no stringy-thingies sticking out from underneath. But then I thought, as I often do, of Henny. And I thought about how, over the course of her short lifetime, Henny faced and aced SO many herculean challenges. Like making a wedding in her house the night before undergoing brain surgery. Like providing an open house for Jerusalem’s homeless and mentally ill. Like frequently going without sleep in order to spend hours praying for others in need. And what would Henny have thought of walking up 18 stairs to get tsitsit so her son could perform a mitzvah? A challenge? You call that a challenge?! So, with Henny’s memory egging me on, I walked up 18 stairs and down 18 stairs and set off hand in hand with Yoni and Yaakov to gan. Until I arrived at Yoni’s gan and looked down and realized that while I had been going up and down 18 stairs, Yaakov’s kippah had fallen off. Thank you Chana Jenny for the inspiration and comic relief! practical and helpful for me. I so love this article! 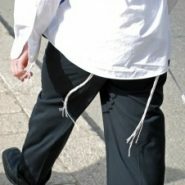 As a Morah of little boys I often wonder if the mom’s notice or care if a particular boy is often without tzitzis. You are right that they sometimes do make brochot on the other child’s tzitzis but your going to get him some demonstrates to him the importance of the mitzvah. (why couldn’t he go to get them? or are they out of his reach?) Children will often take a cue for what happens once to mean that it is okay to do it again…so one day without can lead to many days without. Keeping yarmulkas on is another story, as I’m sure his Gannenet will tell you. thanks hadassah– i had to get the tsitsit since there weren’t any left in his drawer, they were hanging out to dry on the porch. I hope I don’t open a pandora’s box of comments by saying this, but I sometimes have the same thought processes about my gan-aged girls and stockings. While we send them to gans that are largely chareidi, not all of the families are particular about their daughters wearing stockings at this age. We generally are particular about it, but I wonder… On the one hand, like you said, Chana, they’re little, and they have “the rest of their lives…” to wear stockings. On the other hand, there’s something to be said for making it a girsa d’yankuta for them. Really funny. Interesting to.note that tzitzit is d’oraita and kippa isn’t, but somehow it’s easier for us to let it go- definitely been there! I’m fact my 5 year old doesn’t wear his to gan because he says it gets in the way for him to use the toilet and it.bothers him…. I haven’t made a big deal out of it, im sure hell grow out.of that. But whenever there is a special siyum or Shabbat etc, he’s fine to wear it.